Rotomoulding Powder Market size was estimated over 6 Million Tons in 2017 and will witness CAGR over 17% up to 2024. Strong business outlook in automotive, material handling and construction industry owing to superior molding efficiency boosting rotomoulding powder industry share. The product delivers excellent stress bearing property, improved mold flow, and high impact resistance benefits are propelling rotomoulding powder market penetration. Rising demand for hollow plastic products including outdoors playground equipment, storage tanks, containers captured wide attention in industrial applications. Rising water sports activities in the U.S, Canada, and Mexico has positively impacted usage of plastic boating kayak in sports adventure and sailing events augmenting rotomoulding powder market size. Growing travel & tourism owing to improved consumer spending in water adventure events and usage of recreational boats fostering Rotomoulding powder industry share. In addition, automotive industry is witnessing healthy growth owing to the surging sales of SUVs and electric vehicles specifically in China. Stringent government regulations to curb carbon emissions most automotive manufacturing companies are adopting plastic components in vehicles. Surging demand for plastic products as decorative items, attractive showpieces, interiors will provide lucrative business opportunities for manufacturers. In addition, furniture components such as chairs, sitting benches, sofa, shoe fitters are other major application driving industry share. Rotomoulding process offers better efficiency compared to conventional counterparts will fuel product demand. Medical applications includes spine board, end panel of medical equipment and medical bed rest are specially manufactured from rotomoulding powder material. Moreover, recreational products including sporting toy sledge, boat seats, and golf case & accessories are among key application area escalating revenue size. Increasing usage of plastic material in large application owing to excellent weather resistance, long durability, and a cost-efficient advantage is anticipated to fuel rotomoulding powder market share during the forecast period. Fluctuating raw material prices is among the major factor hampering rotomoulding market share. Also, stringent government regulation for plastic production in several countries owing to the emission of hazardous gases polluting the environment and damaging air quality. Plastic production also releases carcinogen gases hampers human health, animal health and ecosystem are key factors limiting industry growth. Polyethylene rotomoulding powder captured over 85% rotomoulding powder market share in 2017. Increasing demand for polyethylene pallets in manufacturing owing to the smaller size. These products are not recommended for direct usage in rotational casting owing to large particle size lowers product quality. To obtain desired output requires smaller particle size to transfer sufficient heat from mold to powder. Particle size improves melting flows, moldability, and development of physical properties during the process. Polyethylene powers show excellent molding, thermally stable, and superior strength benefits are propelling the rotomoulding powder market. Linear Low-Density Polyethylene (LLDP) market is projected to observe over 17% CAGR up to 2024. Excellent mechanical property as compared to other material instigating application areas. LLDP also delivers higher stiffness, exceptional impact strength, and strong stress crack resistance property instigating rotomoulding powder market growth. Tanks segment registered more than USD 3 billion revenue share in 2017. Rotomoulding storage tanks captured maximum market share owing to lightweight advantages in several countries. Storage tanks captured large application share in residential building owing to high durability, high capacity advantages instigating industry share. Cost effective product and lightweight benefits have gained wide attention from the industrial application in chemical & oil industry. Increasing building and construction in several countries along with rising water scarcity in the different region will boost rotomoulding powder market size. Automotive market is anticipated to witness more than 17% up to 2024 owing to rising demand for passenger and commercial vehicles. Stringent government regulations for carbon emission is among major factors influencing adoption of plastic components in vehicles include electric vehicles, SUVs, and XUV. 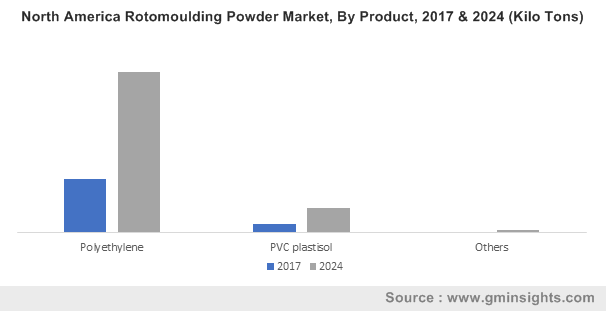 Major automakers Toyota, Hyundai, and Honda are installing polyethylene and PVC components in passenger vehicles owing to superior thermal and impact resistance advantages driving rotational moulding powder market share. Toys segment captured more than 11% market share in 2017 owing varied molding size and shape advantages fueling the rotomoulding powder market share. Kids playground toys and outdoor toys have gained attention in the last few years owing to excellent stress bearing benefits. Toys are mainly manufactured from plastic material include LLDP, HDP, MDP, PVC, nylon and other plastisol. Large availability of several colors, texture, and shades required in the making of toys range for enhancing attractive designs. North America rotomoulding powder market is projected to experience more than 16% CAGR up to 2024. The regional growth is mainly contributed by the U.S. and Canada owing to the strong presence of plastic manufacturing companies and suppliers. Increasing demand for plastic products in the U.S. owing to improved usage in varied application fueling rotomoulding powder market size. Technological advancement in leisure, material handling, and construction equipment mainly generating strong product demand across the region. Industry growth owing to the high-quality material and machinery are providing opportunities for small and medium companies to capture market share. 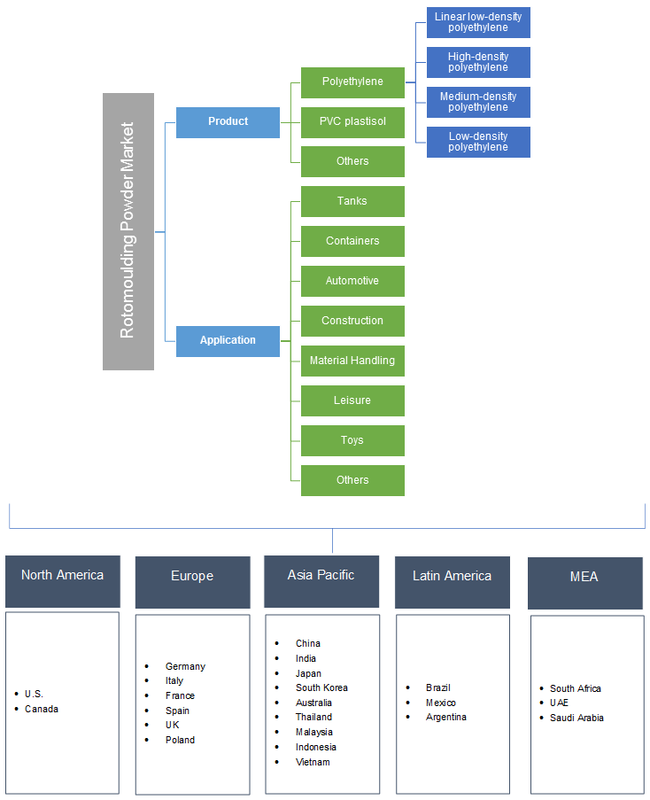 Asia Pacific rotomoulding powder market captured around 25% market share in 2017. Increasing usage of storage tanks, containers and other plastic products owing to growing residential construction are boosting rotomoulding powder market share. India, China, South Korea, and Malaysia are majorly contributing large share owing to surging demand for plastic materials and finished products. Increasing population and improving economic conditions is rising demand for affordable houses in several Asian countries proliferating demand for the storage tank. Rotomoulding powder market is highly fragmented owing to the large presence of domestic and local manufacturing companies in several regions. The major companies are BASF, Dow Chemical Company, Reliance Industries, Phychem Technologies, Matrix Polymers D&M Plastics, and Exxon Mobils. The other players are Chevron Phillips Chemical Company, GreenAge Industries, Eco – Polymers, Perfect Poly Plast, Lyondell Basell, Petrotech Group and Pacific Poly Plast are major companies. The key companies are focusing on strategic acquisition to gain competitive advantage along with increasing R&D initiatives for developing eco-friendly plastic materials. Rotomoulding powder is mainly used in rotomoulding process for manufacturing complicated structures, shapes, and sizes. Rotomoulding is a versatile method for producing large product variety owing to simple and easy techniques in complex structures. Rotomoulder uses large aluminum cast molds offers a high degree of flexibility in the process. Last few decades PVC pipes and PVC material has captured a large market share in pipelines, toys, automotive components, material handling and construction industry.